Knee joint is a major weight bearing joint of the body, used (and abused) during day to day activities, sporting activities, dancing, adventure activities, etc. There are multiple ligaments around the knee joint, out of which 4 are extremely important. These ligaments are important knee stabilizers. If one (or more) ligament is damaged, it can lead to significant functional problems. 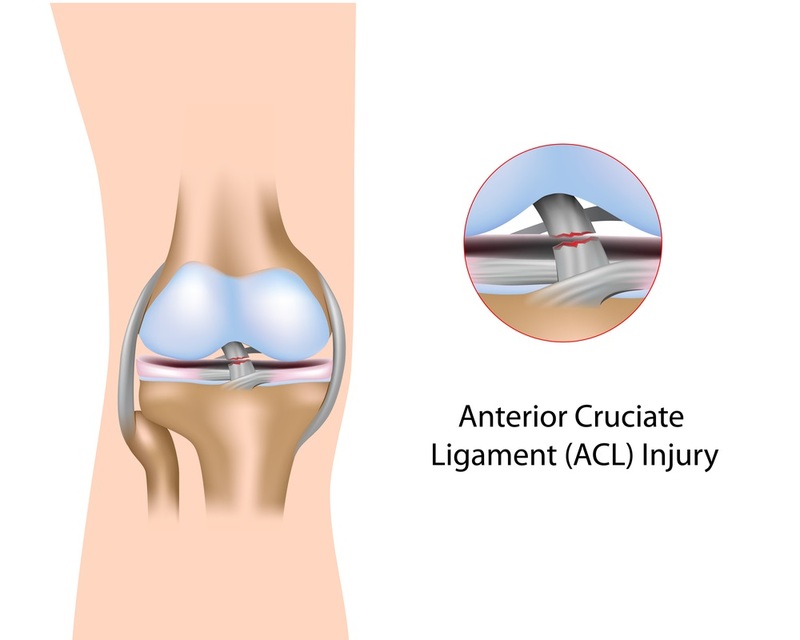 Anterior cruciate ligament (ACL) is one of the strongest ligaments of the joint. It helps stabilize the knee during any sudden twisting/turning as well as during sporting activities. Injury to ACL involves non-contact pivoting injury. If the foot remains planted whilst the upper body twists excessively, it can result in ACL injury. Occasionally, it can also occur during hyperextension injury. ACL injury is commonly seen after sporting injuries i.e. football, rugby, tennis, skiing, snowboarding, badminton, netball, etc. However, it is not uncommon for ACL to be injured during day-to-day activities. Knee joint often swells up soon such an injury. It is often difficult to carry on with the sporting activity. Weight bearing on the affected leg can be difficult for few days. Once the initial pain and swelling settles down, knee generally feels quite lax and one can loose confidence from the knee. Most patients develop giving way sensation in the knee joint. This can affect one’s ability to participate in any strenuous/sporting activity. Occasionally, some patients develop instability even on day-to-day activities. Early clinical assessment by a specialist knee surgeon is recommended for patients with suspected knee ligamentous injury. During the initial consultation, diagnosis is established by thorough history taking and appropriate clinical examination. X-rays are often taken to rule out any bony injury. MRI scans help confirm the clinical diagnosis. Initial management in most cases includes physiotherapy, splintage, advice regarding exercises and analgesia. During subsequent review/follow up with the specialist, if there are symptoms/signs of knee instability, surgical reconstruction of ACL can be considered. The torn ligament is reconstructed generally using auto grafts (tissue from patient’s own body). ACL can be reconstructed using hamstring tendons or using part of patellar tendon with a piece of bone on either side. Results from both these techniques are reproducible and excellent. However, the use of patellar tendon is associated with risk of anterior knee pain (pain in front of the knee) due to the scar. For this reason, use of hamstrings to reconstruct ACL is widely regarded as the gold standard. I routinely use hamstring tendons to reconstruct ACL. I occasionally use patellar tendon graft in specific circumstances. Benefits of ACL reconstruction surgery include improved knee stability and ability to return to full sporting ability. Risks of this surgery include risk of infection (<1%), bleeding, DVT (clots in your lower leg), PE (clots going to your lung), numbness around the scar and some residual laxity. You will generally be admitted to the hospital on the day of the surgery. Most patients stay in the hospital overnight and are safe to be discharged next day. You will be allowed to fully weight bear on the leg using crutches. You can start weaning off the crutches generally after 2 to 3 weeks. No splint is necessary. Driving can be recommenced as soon as independent mobility is achieved. Post-operative physiotherapy is commenced whilst in the hospital followed by outpatient physiotherapy as deemed appropriate for each patient. Initial recovery phase is around 4 to 6 weeks, followed by further rehab and physiotherapy and full recovery including return to sports can be achieved by about 6 months in most cases.